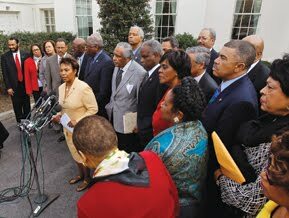 Congressional Black Caucus as PAYBACK ? In the aftermath of the charges recently filed against Rep.'s Charlie Rangel (D-N.Y.) and Maxine Waters (D-Ca.) the question has been raised as to whether these charges may have been racially motivated. Since both are Black, combined with the recent upsurge in race issues in America, many believe that Black politicians are being unfairly targeted. What is lacking in many reports is the fact that the Congressional Black Caucus found themselves recently in a battle with the newly formed Office of Congressional Ethics, an 8-member subcommittee made up of 4 Democrats and 4 Republicans for the purpose of 'draining the swamp' (of misconduct) as Speaker Pelosi calls it. The OCE has become a very powerful group leading to many complaints from members of Congress, particularly the CBC. This past June the CBC lead the charge in complaint regarding the panel's aggressive over reach of power and privately drafted a resolution which they presented to Speaker Pelosi to curtail the OCE's power. As reported by Politico " A Democrat close to Pelosi said the OCE was “way out of bounds” when it sent information to the Justice Department on an investigation into lawmakers’ ties to the defunct PMA lobbying group. In June, in challenge of the OCE's power, a resolution was drafted by Rep. Marcia Fudge (D-Ohio) which was signed by 19 members of the CBC, threatening the power of the panel, due to a strong sentiment to change rules that empower the office to publicize investigations and wreak havoc on lawmakers’ political lives. So the question becomes is the Office of Congressional Ethics unjustly targeting members of the Congressional Black Caucus in retribution or as payback for the caucus's quiet fight to strip them of power ? Both Rangel and Waters are members of the CBC. This question alone may be worthy of investigation. Politico reports "even Majority Leader Steny Hoyer (D-Md.) acknowledges that the House may have to take a second look at the powers of this outside ethics office, which has the authority to publicize its inquiries, unlike the formal House ethics panel, which is much more secretive." In an interview on Reverend Al Sharpton's radio show today Rep. Waters exposed the fact that out of the past 10 OEC investigations, 8 are members of the CBC. Would be interesting to hear Rep. Barbara Lee's (D-Ca./CBC Chairperson) perspective on this subject. We can also just keep our eyes open to see if a further pattern develops.